Wall Street’s wizards think they have finally have found a way to clear up foreclosures. The securitization industry is aching to work its magic on blocks of repossessed properties that have been, or could be, turned into rented accommodation. Done properly, that could help finance investors buying such homes from Fannie Mae and Freddie Mac. But creating bonds from monthly tenant payments faces serious obstacles. Such a product – let’s call it a foreclosed rent-backed security, or FRBS – might borrow a couple of features from its asset-backed brethren. Like commercial mortgage bonds, for example, it would finance buildings that rely on rental income. But like credit card bonds, it might not be backed by any hard assets – it might simply rely on rental income alone. That makes it a real challenge because of the utter lack of useful data for this proposed security. First, the new product may require an entirely new infrastructure for appraising how rentable a home is and at what price. And the faults that the crisis exposed in securitization reinforce how crucial a good crop of historical information is on rental trends. Without them, investors and rating agencies will have no certainty on loss estimates. They’ll also have to make assumptions on new stats like vacancy rates, tenant turnover costs and property management fees. Moreover, potential buyers of the bonds are unlikely to assume the income on a property is stable until tenants have lived in the home for some time or signed a medium to long-term lease. That practice is unusual for renters just moving in. Property managers will also need vetting and monitoring. And with foreclosures focused in a few key regions and resulting rentals appealing to specific segments of the population, concentration risk is likely to be magnified. Tot it all up and these are more than enough challenges for bondholders to demand some juicy compensation for ponying up the cash. That raises the prospect that FRBS could cost more than it’s worth. But even if bankers and issuers do work out the kinks, a deal might not close for years. 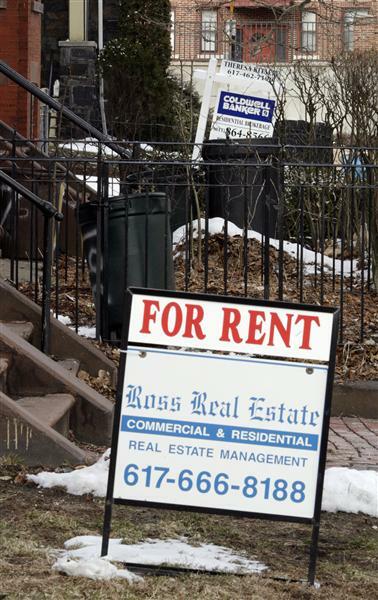 Signs advertise an apartment for rent and a multi-family unit for sale in Somerville, Massachusetts February 28, 2008. Several firms, including Colony Capital and Waypoint Homes, are exploring using securitization to finance purchasing blocks of foreclosed homes. Issuers would rent out these homes and securitize their tenants’ monthly payments to create bonds for investors to purchase. The details of how such a transaction would look remain sketchy. Underlying properties may or may not secure the transactions.